There are basically two approaches to using natives for grazing. The "Conventional Option" involves planting one (or sometimes two) species of the native warm season grasses in a pasture. The "Diversity Option", on the other hand, consists of planting an assortment of native species including warm season grasses, cool season grasses, legumes and other forbs. We believe that the Diversity Option is as good as it gets for the rancher, soil health, and wildlife. However there are a few added challenges in establishment and management of the diversity. So, some folks choose the Conventional Option and establish less diverse pastures to learn to manage the grazing on the big native warm season grasses (e.g. Big Bluestem, Indiangrass, Eastern Gama Grass, and Switchgrass). Other folks choose the Conventional Option because they find that haying is more straightforward with fewer species of plants. Diverse native grasslands offer many benefits to the rancher, wildlife, and soil health. For the rancher, diverse native grasslands can produce twice as much forage1, which is like doubling the size of a ranch! It can also offer high quality forage that is free of toxic endophytes, put good gains on grazing animals, and offer flexibility in grazing dates. For the wildlife, diverse native grasslands that are properly grazed provide the same habitat wildlife were accustomed to prior to the arrival of white man. The native plants provide excellent food and shelter; grazing keeps the plants vegetative for the wildlife and creates variation in the plant structure. For soil health, a properly grazed diverse native grassland promises to restore the soil health and productivity that was in our grassland soils before white man plowed and overgrazed the grasslands. Increasing soil organic matter, healthy microbe populations, and creating an armor on the soil with plant material are all possible and easier with native diversity. Read more about our experiences grazing diverse native grasslands, including data on soil health, forage production, calf weaning weights and more in our e-book. 1 The statement that diverse native grasslands can produce twice as much forage as a monoculture is based on very interesting research by David Tilman and others and published in an article titled "Carbon-Negative Biofuels from Low-Input High-Diversity Grassland Biomass", which is found in Science Volume 314 and published in 2006. To help think about this diversity of plants that should be included, it is helpful to think in terms of functional diversity groups. Generally, a mix of plants from the following functional diversity groups should be included: warm season grasses, cool season grasses and grass-like species, legumes, and forbs (also called wildflowers). 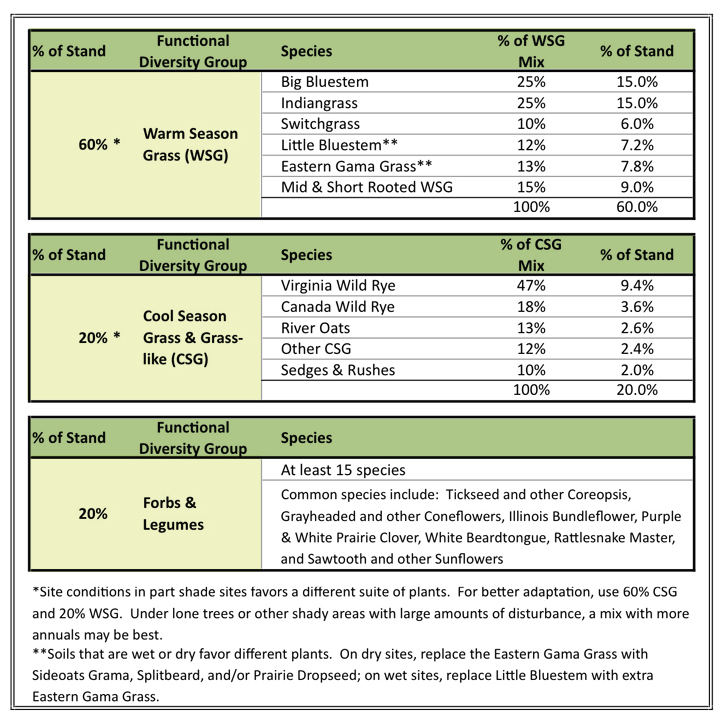 Below is an example mix for a diverse native grassland. This mix may be amended based upon factors such as the site (e.g. upland vs. bottomland, etc.) and establishment plan. Establishment There are generally 3 methods to establish a diverse native pasture. Choosing a method depends on the initial condition of the pasture and the desired mix composition in the planting. Once natives have been established in a diverse planting, there are no good options to control undesirable plants. For this reason, diverse plantings often work best on areas coming out of crops where the weeds have been controlled well, areas that have never been planted to introduced plants such as Fescue, Serecia Lespedeza, Bermuda Grass, Smooth Brome, or Johnson Grass (e.g. a savanna restoration that has been forested in the recent history), or areas with multiple years of control of weed seeds in the seedbank. Read the Planting Timeline: Establishing Diverse Natives for Grazing. For thoughts on using drills and broadcast methods to get the seed planted, read the Seeding Guide. Timing refers to the time of year that the plant is grazed. A diverse grassland should not be repeatedly grazed at the same time of year. Frequency is a measure of the length of time a plant has to regrow before the next graze. A diverse grassland needs to be allowed to fully recover after a grazing event before the next grazing episode. Intensity reflects the degree of utilization, or in other words the amount of the plant that was removed in a grazing event. It interacts with frequency in that the more intensely a plant was grazed, the less frequently it should be grazed. However, a grazing event in which the plants are grazed very lightly can be repeated more often. These three factors apply to any forage species. In many conventional grazing systems, the manager does not recognize it because the plants survive. However, the plants are not thriving, and the grazing manager does not realize the amount of production that is lost. In a diverse grassland, it is important to remember that because of differences in palatability, the intensity of the graze may be different for different plant species. Attention must be given the species that are grazed most intensely during a grazing event, and these plants need to be allowed to recover before the animals return. Read more thoughts and observations in the guide Grazing of Diverse Native Grasslands. What to Plant Switchgrass and Eastern Gama Grass produce large quantities of forage but earlier than other warm seasons; choose one of these if the grazing system has a good balance of warm and cool season grasses. Although they may produce slightly less tonnage, Big Bluestem and Indiangrass peak in production later. They are ideal for cool season grass dominated operations, and they also work well mixed together. Little Bluestem will produce a smaller quantity of forage, but it can be a great part of a mix on drier areas of the field. Even in these conventional native warm season grass plantings, adding some native cool season plants can be of great benefit. Among other things, the cool seasons and warm seasons mixed together make better use of the solar collector (the ground on which we are growing plants-because the sunlight is being used to produce forage in cool and warm weather), is better for soil health, creates better wildlife habitat, and expedites nutrient recycling. Each grass has its season of growth. This graph illustrates the percent of the plant's growth that occurs in each month. Cool season grasses begin their growth early in the spring. Warm season grasses wait for the warm temperatures of summer to produce. There are differences in timing of production even among the warm seasons. When choosing grasses to plant in a grazing system, take into account the growth curve of the forages already in place and consider the curve of the forage to be planted. Make sure they complement each other and that quality forage is being produced throughout the growing season. Data from NRCSCode 528, 2007. For a pasture that is currently growing fescue, the following steps usually result in a successful establishment of imazapic tolerant grasses. 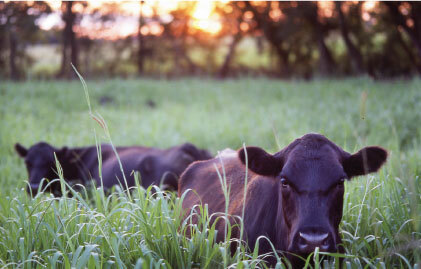 Graze pasture short & even (~August) - before fall rains, graze the pasture so that it will be actively growing and herbicide can make good contact with the regrowth of all plants. Spray with glyphosate (~October) - fescue should be actively growing. Follow up on any misses and pay special attention to fence lines, field borders, areas under trees, creek banks, and other hard to get to areas. Plant & spray (~April) - plant only the Panoramic-tolerant warm season grasses. Anytime within one week before or after planting, spray the field with glyphosate (which will kill green, actively growing plants) and Panoramic (which will give residual control of many annual weeds). A low or medium rate of Panoramic is usually sufficient. Always read and follow label directions of an herbicide! The labels are not only helpful in knowing how to be safe, but they also provide great information about how the herbicide is most effective and how to keep the soil and environment healthy. Panoramic will not work with plantings of Eastern Gama Grass or Switchgrass. The process should begin the same though; the existing pasture plants must be killed. Eastern Gama Grass seeds must be planted in winter (before February 15th). When seeding native grass seeds it is important to have a firm seedbed. The soil should be firmly packed before planting. When walking, boot heels should make only very slight indentions. If needed, roll the field before planting. Most native seeds do not need to be buried beneath the soil when planted; seed-to-soil contact is sufficient. Eastern Gama is the exception as it is best planted at a depth of 1/2" to 1". For more thoughts on seeding including tips for using drills and broadcast methods, read the Seeding Guide. Native warm season grasses should not be grazed to the same height that cool season grasses are grazed to. The rule of thumb is 8 inches of plant should remain on warm seasons and 4 inches on cool seasons. This rule of thumb helps understand the difference in plants, but there are many exceptions and other factors. Each plant species has a window of palatability. For instance, warm season grasses are most palatable during the summer, native sunflowers are most readily consumed right before bloom, and cool season grasses are best in the fall and spring. Don't wait too late in the spring to begin grazing the warm season grasses- In grazing systems dominated with cool season grasses, it is tempting to utilize the spring flush of cool season growth before grazing warm season grasses. However, waiting too long can limit animal performance as warm season grass quality declines as it matures. On the other hand, potential production can be limited if the plants are grazed too early. Native warm season grasses as stockpile - While these grasses may be stockpiled for use in the dormant season, quality is much lower than in the growing season. If you choose to graze the stockpile, keep an eye on animal condition, and beware that some grass species loose quality faster than others. Visit the Hamilton Ranch for a Pasture Walk to see a diverse native grassland being grazed as well as other warm season grass fields.